The market for virtual reality glasses is rapidly growing. Nowadays, a lot of new retailers are entering the market. I had a hard time figuring out which virtual reality glasses fit my needs. That was until I stumbled upon the Sarlar 3D VR Headset. It proves to be a worthy asset in my entertainment experience. The purpose of a VR headset can greatly vary. There are headsets available for over $400. These are used for extensive gaming, learning skills, and watching television. There are also headsets for only $15 that need a mobile phone. We’ve come up with elements that you have to take into account when buying a VR headset. What is the purpose of the VR headset? We can distinguish three kinds of Virtual Reality headsets. Tethered VR headsets (wired to your computer or gaming console), Virtual headsets with a built-in screen, and mobile VR headsets. Mobile VR headsets are more useful for entertainment via your mobile device. 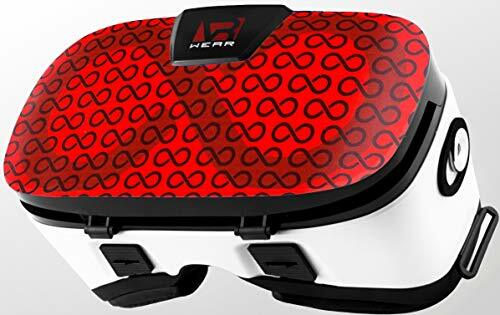 Tethered VR goggles and headsets with a built-in screen are ideal for an optimal gaming experience, learning skills, and watching television. VR headsets with a built-in screen and tethered headsets are more expensive than mobile VR headsets. If you are able and willing to spend several hundred dollars on a VR headset with more capabilities, be my guest. If you prefer mobile entertainment via movies and apps, a VR headset up to $50 does the trick. If you don’t have a gaming console or high-end computer, you can forget about a high-end VR headset. Unless you buy one of those, you are stuck with a mobile VR headset. If you have an old mobile phone, even the mobile VR headset might be too much. If you are wearing glasses, this is an aspect that you need to consider. Not all VR headsets are able to fit over glasses. The wider the field of view, the more you experience being in the virtual reality world. The smaller the field of view, the more you feel like you’re wearing diving goggles. IT'S COMFORTABLE- Sarlar 3d VR is extremely light on your eyes and Nose Bridge. Extra cushioning around the headset offers ultimate luxury. You will never feel the weight of such a high performance while spending hours watching movies. The velcro straps sit comfortably over your head and fully adjustable to the shape of your head. Once you find your perfect position, the VR headset will sit securely for as long as desired. IT'S IMMERSIVE- Sarlar virtual reality headset is designed for a full immersive field of view. Experience panoramic view with immersive FOV102, whilst the screen gets magnified by 5.2 times. Its super vision will give you an unlimited world with incredible visual fidelity and immersive feeling. 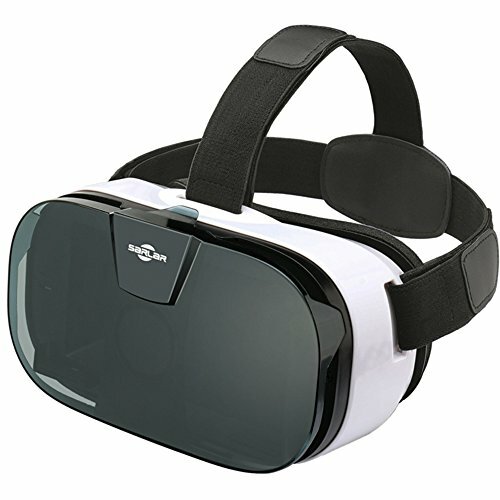 The Sarlar VR Headset is a mobile headset compatible with iOS, Android and Microsoft phones. This means there is a wide variety of apps available for you to use. The headset provides a base structure in which you can mount your mobile device. The headset uses three straps around your head to prevent the headset from moving. The product promises a 102-degree field of view. With the additionally provided guard, there is almost no sunlight coming in. Also, there are bars used to keep phones of different sizes in place in the case of the headset. The product claims to be compatible both with and without glasses. There are no headphones or earbuds incorporated into the headset. However, there is a headphone jack opening that provides a way of entry to use the earbuds with your mobile phone. Because the headset is mobile, you can move around freely. The Sarlar VR headset provides three straps around your head. One goes over your head, the other two go over the sides just above your ear. This prevents the headset from moving around. Due to the velcro strap harness, the size is easily adjustable to your preferences. With only 0.9 pounds, the headset is light. When strapped right, the weight on your nose is minimized. This allows you to watch hours of content without feeling it. Due to the adjustable focus, the VR headset is used without glasses. If you have prescription glasses, using the VR glasses is no problem. The padding gives enough room to use the headset while keeping your glasses on. This is true for glasses with a standard frame. For glasses with a bigger frame, there is no guarantee that the VR headset can be used while wearing glasses. The foam padding with which your face touches the VR headset is comfortable to wear. This also makes sure that the headset does not rest on your nose bone. Even if the velcro straps are strapped on tight, the headset is still comfortable to wear. Due to the availability of iOS, Android and Microsoft smartphones, there are lots of apps available on the App Store and Google Play Store. In total, there are more than 500 apps available that support 3D virtual reality with these glasses. The VR headset is also capable of displaying 3D content from Netflix and Hulu. One of the best features is that it also supports YouTube-videos, unlike other VR glasses in this pricing range. Also, the fact that it supports Microsoft is a unique selling point. The adjustable bars make the VR headset compatible for most smartphones currently available. Due to the middle-line adjustment, the headset is calibrated for all sizes of phones. Once you’ve set up the right views for one phone, you won’t have to do it again afterward. The phone is mounted onto the VR headset by opening the front. The phone is secured by a foam pad. This makes sure that phones with both smooth and rough back covers stay in place. Additionally, bars can be included in the front to secure your phone. Because the bars are adjustable, they can be used on almost all phones. There is a glare shield provided with the VR headset. This gives you the opportunity to choose between a ‘gaming mode’ and ‘movie mode’. The glare shield is ideally used for virtual reality gaming purposes. It can be easily removed from the VR headset to increase your movie experience. With 102 degrees, you have a large frame of view available. This gives you an almost panoramic view while watching movies or playing games. Also, the screen gets magnified 5.2 times, which gives the feeling of being in the virtual reality world. This frame of view is used for both the gaming experience and the movie experience. This does not depend on the use of the glare shield provided with the VR headset. Most newer smartphones provide the opportunity to connect with a Bluetooth headset. The older devices still use the headphone jack to connect headphones to your device. With the Sarlar VR 3D Headset, phones can be used with and without a headphone jack. There is an opening in the case of the VR headset. This allows you to use the headphone jack of your smartphone. Spherical lenses tend to create areas with a lack of focus. Aspherical lenses correct this issue. This prevents fuzzy images while using the headset. The fuzzy images may cause a feeling of dizziness for some people. The aspherical lenses decrease the fuzziness in images. This making this feeling of fuzziness go away. Besides, the lens is adjustable to your preferences per eye. Per eye, you can adjust the focus to prevent fuzzy images. Also, a clear focus prevents your eyes from getting hurt by a bad view. It is possible to further adjust the focus by using the buttons on the bottom of the VR headset. This allows you to alter the space between the lenses and your eyes. Wearing performance does not change, only the amount of space is altered by moving the lens. This feature is included to reduce possible double vision. Where lots of VR headsets provide fewer features for ten times the price, this VR headset is worth its money. The features have a positive effect on your gaming- or movie experience. This VR headset hardly disappoints you. There are other VR glasses available with the same or comparable features. But, the price of these VR glasses increases. For this price, there are few VR headsets that can compete with the Sarlar VR Glasses. The VR headset being wireless makes you very mobile. You can freely move around without losing connection to certain consoles. Although not being able to move around in real life while you are in the virtual reality world, being wireless is a big plus. How do people experience the Sarlar VR 3D Headset? To get a grip on the experience of other users, I’ve scoured the internet looking for reliable sources. The majority of users experiences the VR headset as reliable. Also, they highlight the virtual reality experience it provides. Besides that, the value of the headset for the price it has is a big plus. At last, the high-quality adjustable lenses are highlighted in these reviews. 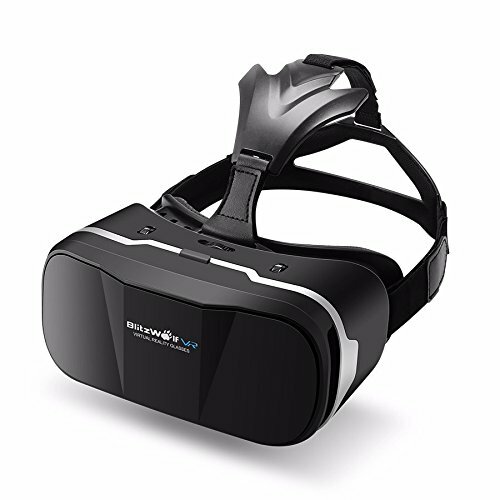 The VR WEAR 3D Headset has similar features to the Sarlar VR 3D Headset. Both headsets use a three strap harness system and provide high-quality aspherical lenses. They also provide holes for the headphone jack. The VR WEAR 3D Headset has a slightly bigger frame of view. Besides that, it uses a leather face pad, where the Sarlar Headset uses a foam face pad. The VR WEAR Headset will most likely work better for you if you want that extra comfort and a wider field of view. The Sarlar VR 3D, however, is a better fit if you want to save some money and still have a decent VR headset. If you think the Virtual Reality WEAR 3D glasses might be something for you, click here. The BlitzWolf 3D VR Headset is comparable with the Sarlar VR 3D Headset. Both headsets use quality aspherical lenses, have holes for the headphone jack and are praised for their comfortable wear. The BlitzWolf 3D Virtual Reality glasses uses a bigger strap that goes over your head than the Sarlar Headset. Also, it gives some extra straps at the back of your head, that provide more comfort when wearing the VR headset. If you need more comfortable wear, the BlitzWolf is the one to go with. However, if you prefer a better clipping case, the Sarlar Headset is the one to go with. If you want to check the product out, click here. The BNEXT 3D VR Headset also uses a three strap harness system, together with holes for headphone wires and adjustable lenses. It also uses foam padding where the headset rests on your face. Compared to the Sarlar Headset, the BNEXT Headset is more expensive. Also, the headset has a slightly larger field of view. In comparison with the Sarlar headset, the BNEXT headset has opportunities for augmented reality. If you are interested in augmented reality, the BNEXT might be something for you. If you are looking for a cheaper option with high wearing comfort and high-quality lenses, the Sarlar Headset might be better for you. 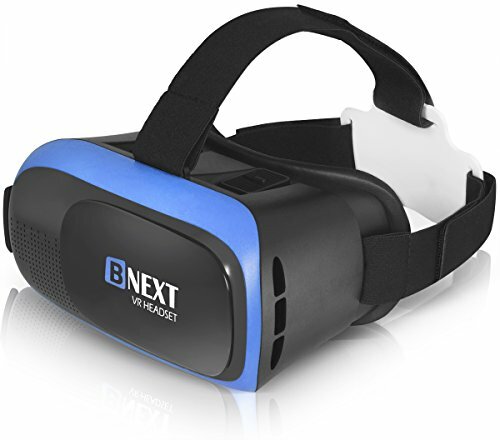 If you are interested in the BNEXT 3D virtual reality goggles, click here. The Sarlar VR Headset is a good choice if you want value for your money. It has adjustable, high-quality aspherical lenses, next to other helpful features. If you are new to VR Headsets, the Sarlar Virtual Reality goggles is the one to go with, mainly because of the price. It allows you to get more familiar with virtual reality without paying too much. If you think that this product is something you might like, click here.